Following these 8 simple rules can help thwart a future dog behavior problem in your Great Dane or large breed dog. These eight simple common sense rules..
Will keep innocent puppy behavior and actions from leading to bad habits, or a dog behavior problem that can be dangerous with an adult giant breed and difficult to correct! Prevention starts early, enforcing simple "house rules" will pay-off, especially with a puppy who will grow to giant Dane stature. It's easy and simply put, we've come up with eight innocent puppy quirks that we should NOT to teach a Great Dane. Trust us, it's much easier prevent a dog behavior problem before it begins then to deal with and correct as a bad habit. Bad dog behavior and habits are hard to break and you will absolutely be pulling your hair out with a Great Dane! The good news is you can start with these "house rules" the day your puppy comes home. So, let's have at it! #1 - Calm in the house! If you don't want a house full of broken furniture, we recommend never playing rough with your Dane, especially inside your home. When your Dane gets the "zoomies", a.k.a., a burst of energy.. calmly direct them to a safe outdoor area to run around and let it all hang out. #2 - Watch those paws! 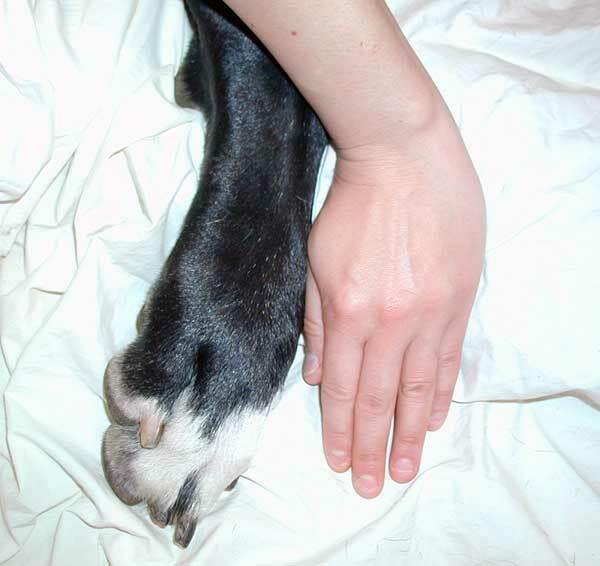 Adult Great Danes have massive paws as large as a human hand. It's kind of cute when a pup gives you a high five, however, an adult Great Dane can hit you like a heavyweight boxer. Playing patty-cake with your dog can lead to a dog behavior problem resulting in black eyes, broken eyeglasses and other painful injuries when your dog is full grown. #3 - Four on the floor! "An unexpected tango can easily topple a full grown man!" #4 - Off the couch! Your call, Danes are notorious couch potatoes and bed potatoes for that matter. Typically, if you let them up once you can expect they will be there for life. This can be a troublesome dog behavior problem and may become a habit that is very difficult to break. 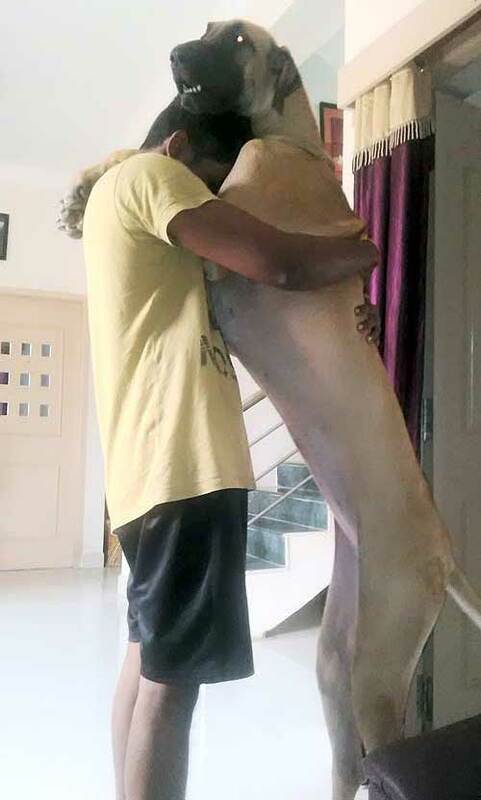 Don't get me wrong, it's nice to cuddle up with a big warm Dane but I should warn you! My wife and I tried it once, we both woke up on opposite sides of the bed with about 12-inches of space each and we have a king size bed:) As you read more about training Great Danes, you'll find that a dog should be at the bottom of the pecking order within its human pack. Allowing a dog up on your throne may give him a sense of power. This can escalate over time into other bad dog behavior, in some cases, even aggression. #5 - No people parts! As with all dogs, it's not advised to let a dog mouth you. Great Danes can be very gentle, even with powerful jaws, yet this behavior is unacceptable. Mouthing a human can lead to a dog with a behavior problem around strangers. Go ahead, let her lick you to death but always keep people parts out of the mouth. #6 - Lower your voice! "A Great Dane's bark is a powerful deep blast that echo's through the valley." #7 - Stand up straight! Danes are skilled leaners so this may be tough. Not necessarily bad dog behavior amongst adults, yet a leaning Dane can easily topple most children. Remember, your puppy's actions are probably cute at the moment, but give it a year. Many of these seemingly harmless quirks can become down right dangerous when delivered by a 160-pound adult Great Dane. House rules should be enforced, you can even come up with your own! Just stick with them, start as early as you can and you'll avoid all together a dog behavior problem, bad dog behavior, and future bad habits in your adult Great Dane.